Does your career or volunteer service bring you into contact with unfamiliar critters? Many routinely enter others’ properties and the sanctuary of others’ homes. In so doing, they regularly encounter unfamiliar animals, be it an overzealous pet, a guard dog on duty, or livestock on rural properties. 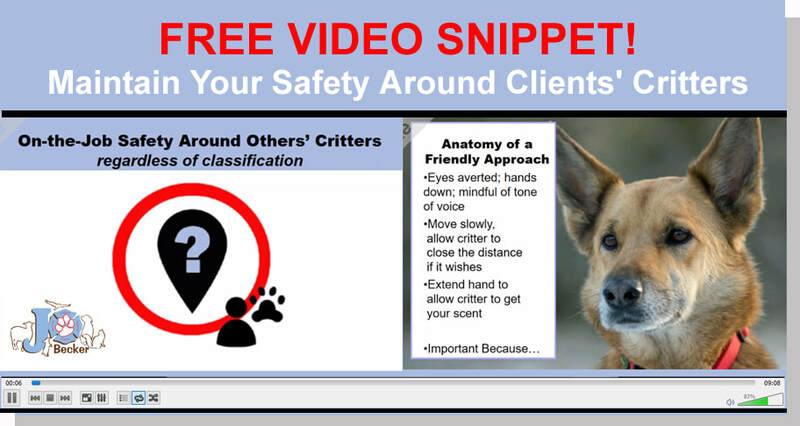 The fundamentals of critter body language can do much to increase personal safety (and good customer and community relations) while on the job. Watch a snippet from a housing industry presentation on maintaining personal safety on-the-job. a full array of safety topics & other talks just for you! When it comes to animals, Jo aims to help fellow humans understand the basic elements of critter communication – to see how and what we’re conveying even when we don’t know we are. She also shows audiences how animals are communicating with us all the time, we just don’t know their language. Her unique perspective based on predator / prey traits helps those that encounter others' animals on the job to maintain personal safety. As a bonus, the same techniques enables animals owners to enhance the human-critter bond. Jo’s also an emergency preparedness pro. and, as such, is mindful of preparing for and minimizing disasters -- be they personal, regional, or large-scale. Those personal emergencies born from miscommunication with the critters around us are incidents that, very often, can be avoided all together. Regardless of topic or audience, Jo aims to provide historical and relatable context, understandable concepts, and bottom line considerations. She offers programs that are educational yet entertaining, and infused with real-world scenarios as well as personal experience. Jo Becker is an Oregon-based speaker and writer that takes an entertaining, personable approach to educating audiences about ‘doom and gloom’ matters as well as ‘dry legal subjects.’ Her presentations are informative, empowering, and inspiring.